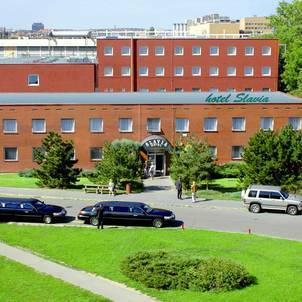 Hotel Slavia is the rebuilt hotel located in sports complex of Slavia Praha. The hotel offers two parts – Cathegory 3* (older) and Cathegory 3*+ (new). Access to the town center is possible by tram lines, either directly to the centre (9 stops) by lines 22 and 24 or by line 7 (3 stops to subway "A", Strasnicka. The hotel offers a total of 190 beds in single, twin and triple rooms. All rooms include shower, WC and satellite TV.